"Das Rote Handtuch (Myriam) Paris"
Carl Otto Muller first studied at the Kunstgewerbschule in Munich under Caspar and, subsequently, at the Dortmund Kunstakademie. He furthered his studies in Paris and Italy. During a long and successful career, he was the recipient of numerous medals and prizes and juried awards. He was the subject of many solo-exhibitions including at the Koll-Austellung, (1947), the Stutttgart Kunstkabinett (1952), the Eichstadt Gewerbehalle and Munich’s Stadtgalerie (1955). 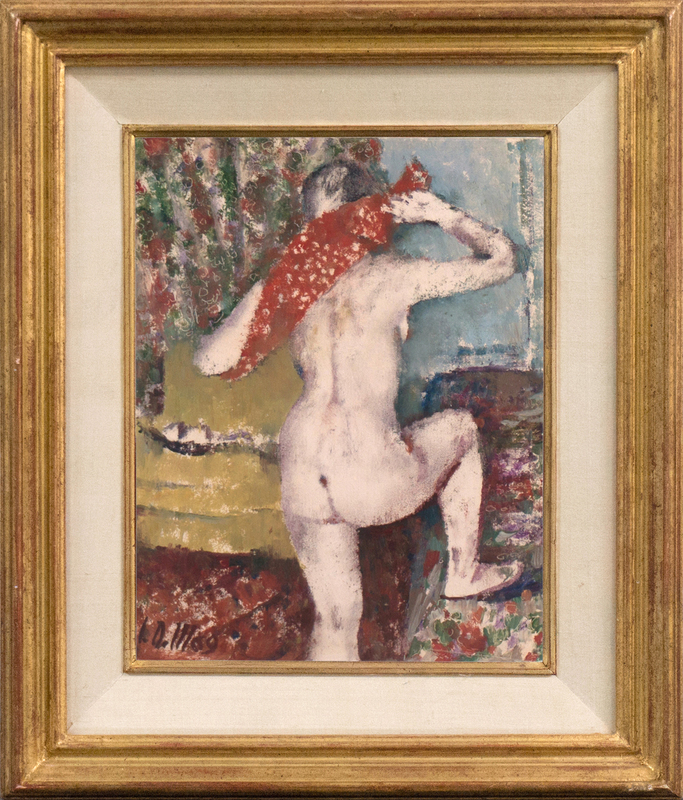 Muller is known particularly for his subtle and psychologically-penetrating studies of women painted in a modulated post-Impressionist style reminiscent of Bonnard’s Intimism. We are pleased to offer this dynamic figural study from Muller's mature period. Displayed in a water-gilt, linen-lined frame. Vollmer Allgemeines Lexikon der Bildenden Künstler des 20. Jarhhunderts, Hans Vollmer, Deutscher Taschenbuch Verlag 1992, Vol. 3, p. 438; et al.